Smart Living - embracing innovations that help you live smarter, happier, and healthier. Oregon Scientific was founded in 1989 in Portland, Oregon, USA, a city that prides itself on balancing the amenities of modern urban living with a healthy respect for nature and the outdoors. In this uniquely forward-thinking city where healthy living is a priority and creativity a highly prized commodity, Oregon Scientific nurtured the concept of “Smart Living”. At Oregon Scientific, we believe the key to improving life is not working harder, but living smarter. Oregon Scientific’s products are made with innovation, precision and passion to bring to your daily life a fresh perspective and a new, creative way of meeting your everyday needs. Each product we create reflects the highest pursuits of technology and design, harmoniously blending fine aesthetic values with a keen appreciation for our natural surroundings. Our products are more than beautiful accessories – they enable you to pursue your personal goals for better health and a better living environment, so you can find more satisfaction in all you do. LW302 Anytime Weather Kit BasicFinally an affordable Weather Station that you can access 24/7 from y..
Oregon Scientific LW301 Anywhere Weather Kit Weather StationThe Ultimate for the Weather Enthusiast!.. Oregon WMR88 Wireless Pro Weather Station w/ USBAnimated weather forecast includes sunny partly clou..
Oregon WMR89 Wireless Pro Weather Station with USBNEW! 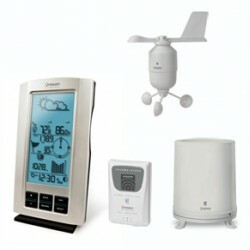 upgrade from the Oregon Scientific WMR88Get ..
WMR200 Advanced Pro Weather StationThe Weather Center gives you all the weather data you’ll need—fro..
WMR80 Oregon Wireless Weather StationFull Wireless Weather StationThe perfect addition to your hom..